The term ‘cast iron’ represents a large family of ferrous alloys. Cast irons are multi-component ferrous alloys, which solidify with a eutectic. The major elements of cast irons are iron, carbon (2 % or more), silicon (1 % to 3 %), minor elements (less than 0.1 %), and often alloying elements (less than 0.1%). Cast iron has higher carbon and silicon contents than steel. The structure of cast iron displays a richer carbon phase than that of steel because of its higher carbon content. Cast iron can solidify according to the thermodynamically metastable Fe-Fe3C (iron carbide) system or the stable iron-graphite system depending principally on composition, cooling rate, and melt treatment. Cast iron in its basic form is a brittle material which has a very little impact strength. It has a little or practically no toughness when compared to low carbon steels. It has a fraction of the tensile strength of low carbon steels. When a cast iron piece fails it does not deform in a noticeable way and appears to snap apart or break in a manner consistent with a snap. There is no early warning of a failure. The graphite phase which is pure carbon acts as a natural defect in the material. The iron is so saturated with carbon that graphite forms (free carbon) and causes the cast iron to be weaker. Much smaller amounts of carbon is combined with iron (Fe) in the form of iron carbide (Fe3C, cementite) which is hard and brittle. During the solidification process, when the metastable route is followed, the rich carbon phase in the eutectic is the iron carbide and when the stable solidification route is followed, the rich carbon phase is graphite. Referring only to the binary Fe-Fe3C or iron-graphite system, cast iron can be defined as an iron-carbon alloy with more than 2 % C. However silicon and other alloying elements can considerably change the maximum solubility of carbon in austenite. Therefore, in exceptional cases, alloyed cast iron with less than 2 % C can solidify with a eutectic structure and therefore still belong to the family of ‘cast irons’. The formation of stable or metastable eutectic is a function of many factors, which include the nucleation potential of the liquid, chemical composition, and cooling rate. The first two factors control the graphitization potential of the iron. A high graphitization potential results in irons with graphite as the rich carbon phase, while a low graphitization potential result in irons with iron carbide. The two basic types of eutectics, the stable austenite-graphite and the metastable austenite-iron carbide, have wide differences in their mechanical properties, such as strength, hardness, toughness, and ductility. Therefore, the basic purpose of the metallurgical processing of cast iron is to influence the type, amount, and morphology of the eutectic in order to achieve the desired mechanical properties. The properties of cast iron can be varied widely by varying the percentages of carbon and silicon, by alloying with various metallic elements, and by varying the practices of melting, casting, and heat treatment. The metallurgy of cast irons has many similarities to that of steel, but the differences are important to the metallurgist who works with cast irons. Since the common grades of steel contain low amount of alloying elements, they are normally be considered as binary iron-carbon alloys and the iron-carbon diagram (Fig. 1) can be used to interpret their structures under conditions of slow or near-equilibrium transformation. The cast irons, however, contain appreciable amounts of silicon in addition to higher carbon contents, and hence they are to be considered ternary Fe-C-Si alloys. The additional constituent silicon changes the iron-carbon diagram. 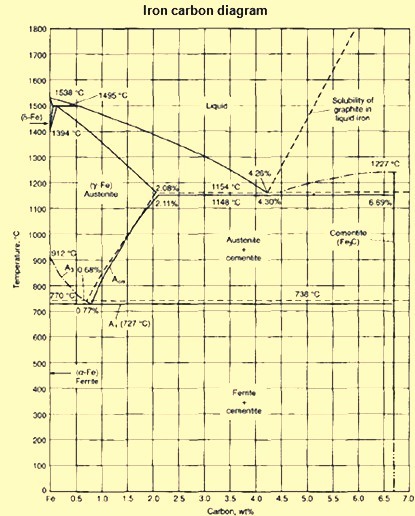 A section through the ternary Fe-Fe3C-Si diagram at 2 % silicon (which approximates the silicon content of many cast irons) provides a convenient reference for discussing the metallurgy of cast iron (Fig 2). The diagram resembles the binary Fe-Fe3C diagram, but shows important differences characteristic of ternary systems. Eutectic and eutectoid temperatures change from single values in the Fe-Fe3C system to temperature ranges in the Fe-Fe3C-Si system. The eutectic and eutectoid points shift to lower carbon contents. It also represents the metastable equilibrium between iron and iron carbide (cementite), a metastable system. The silicon that is present remains in solid solution in the iron, in both ferrite and austenite, so it affects only the conditions and the kinetics of carbide formation on cooling, not the composition of the carbide phase. Some of the silicon may precipitate along with the carbide, but it cannot be distinguished as a different phase. The solidification of certain compositions occurs not in the metastable system, but rather in the stable system, where the products are iron and graphite rather than iron and carbide. In short, the addition of silicon to a binary iron-carbon alloy decreases the stability of Fe3C, which is already metastable, and increases the stability of ferrite. As the silicon content in the Fe-C-Si system increases, the carbon contents of the eutectic and eutectoid decrease, while the eutectic and eutectoid temperatures increase. It is convenient to combine the effect of the silicon with that of the carbon into a single factor, which is called the carbon equivalent (CE). 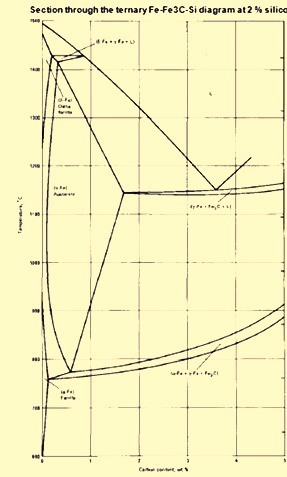 The CE of a cast iron describes how close a given analysis is to that of the eutectic composition. The CE of the eutectic without silicon is at 4.3 %. As the silicon content of iron is increased, the carbon content of the eutectic is decreased. There is a linear relation and can be expressed as a simple equation given below. A CE of 3.9 represents an alloy of lower carbon and silicon content (hypoeutectic) than the eutectic composition, and a CE of 4.6 represents an alloy of greater carbon and silicon content (hypereutectic) than the eutectic composition. Irons of the same CE value may be obtained with different carbon and silicon values. Other values representing the CE of cast irons have also been proposed. When appreciable amount of phosphorus is present in the iron, the phosphorus content of the iron is included in the CE equation which is as follows. Thus, an iron with 3.2 % C, 2 % Si, and 0.4 % P has a CE value of 4.0 and is hypoeutectic. An iron with 3.2 % C, 2 % Si, and 1.3% P has a CE value of 4.3 and is eutectic. An iron with 3.2 % C, 2.6 % Si, and 1.3 % P has a CE value of 4.5 and is hypereutectic. The total carbon and silicon contents of the alloy, as related in the CE value, not only establish the solidification temperature range of the alloy, but are also related to the foundry characteristics of the alloy and its properties. Cast irons of constant CE, but with appreciably different carbon and silicon contents, do not have similar casting properties. Carbon is more than twice more effective in preventing solidification shrinkage than the CE equation indicates. However, silicon is more effective in keeping thin sections from becoming hard. There are similar differences in some of the use properties, and these limit the value of CE in specifications. The main factors which have influence on the micro structure of the cast iron are (i) chemical composition, (ii) cooling rate, (iii) liquid treatment, and (iv) heat treatment. In addition, the following aspects of combined carbon in cast irons need to be considered. In the original cooling or through subsequent heat treatment, a matrix can be internally decarburized or carburized by depositing graphite on existing sites or by dissolving carbon from them. Depending on the silicon content and the cooling rate, the pearlite in iron can vary in carbon content. This is a ternary system, and the carbon content of pearlite can be as low as 0.50 % with 2.5 % Si. The measured hardness of graphitic cast irons is influenced by the graphite, especially in gray cast iron. Martensite micro hardness may be as high as 66 HRC or as low as 54 HRC in gray cast iron (58 HRC in ductile). The critical temperature of iron is influenced (raised) by silicon content, not by the carbon content. Historically, the first classification of cast iron was based on its fracture. Initially cast iron was classified into two types namely white cast iron and gray cast iron as given below. White cast iron – It exhibits a white, crystalline fracture surface since fracture in this cast iron occurs along the iron carbide plates. It is the result of metastable solidification (Fe3C eutectic). White cast iron is named such since this iron is having characteristic white fracture surface. This cast iron is formed when the carbon in solution in the liquid iron does not form graphite on solidification but remains combined with the iron, often in the form of massive carbides. The carbon is present in the form of carbides mainly Fe 3C and Cr7C3. Sometimes in white cast irons there are present complex carbides such as (Fe,Cr)3C from additions of 3 to 5 % Ni and 1.5 to 2.5 % Cr, (Cr,Fe) 7C3 from additions of 11 to 35 % Cr or those containing other carbide-forming elements. White cast iron is hard and brittle and produces white, crystalline fracture surface. White cast iron has high compressive strength (more than 1380 N/sq mm) and good retention of strength and hardness at elevated temperature. It is very often used for its excellent resistance to wear and abrasion. The massive carbides in the microstructure are chiefly responsible for these properties. White cast irons are produced by chilling some surfaces of the cast mould. Chilling prevents formation of graphite during solidification of the cast iron. Applications of white cast irons include brake shoes, shot blasting nozzles, mill liners, crushers, pump impellers and other abrasion resistant parts. Gray cast iron – It exhibits a gray fracture surface consisting of ferrite and dispersed graphite flakes. When the composition of the iron and the cooling rate at solidification are suitable, a substantial portion of the carbon content separates out of the liquid to form flakes of graphite. The fracture path of such iron follows the graphite flakes. The fracture surface of this iron appears gray because of the predominance of exposed graphite. Gray cast iron is the result of stable solidification produced at slow cooling. It has several unique properties that are derived from the existence of flake graphite in the microstructure. It possesses high compressing strength, fatigue resistance and wear resistance. It is relatively soft and can be machined and welded easily. It has hardness conducive to good wear resistance. It resists galling under boundary-lubrication conditions. It has very good properties for use in vibration damping or moderate thermal shock applications. It is used for engine cylinder blocks, gears, flywheels, water pipes, brake discs, and machine tool structures etc. Presently the common classification scheme divides cast irons into four basic types. These are (i) white cast iron, (ii) gray cast iron, (iii) ductile cast iron, and (iv) malleable cast iron. While the white cast iron and gray cast iron are described above, the ductile cast iron and malleable cast iron are described below. Ductile cast iron – It derives its name from the fact that, in the as-cast form, it exhibits measurable ductility. By contrast, neither white nor gray iron exhibits significant ductility in a standard tensile test. It is also known as nodular iron or spheroidal graphite cast iron. It is similar to gray iron in composition but during casting of ductile cast iron the graphite is caused to nucleate as spherical particles instead of flakes. This is achieved through the addition of a very small but definite amount of magnesium and/or cerium to the molten iron through a process step called nodulizing. The ductile cast iron consists of spheroid nodular graphite particles in ferrite or pearlite matrix. It is produced from the same raw materials as gray iron, but these materials are to be purer especially with respect to sulphur. Casting properties of ductile cast iron such as fluidity etc. are similar to those of gray cast iron. Main advantage of ductile cast iron over gray cast iron is its combination of high strength with ductility. They also possess good fatigue strength, wear resistance, shock resistance, and high modulus of elasticity. Martensitic ductile cast irons and austempered ductile cast irons exhibit even better properties. Applications of nodular (ductile) cast irons include automotive engine crankshafts, heavy duty gears, military vehicles, and railway wagons. Malleable cast iron – It is cast as white cast iron, then “malleabilized” (i.e., heat treated to impart ductility to an otherwise brittle material). The micro structure consists of ferrite and particles of free graphite. This cast iron encompasses a form of graphite called temper carbon. This form of graphite is produced by the heat treatment of white cast iron. When a white cast iron is heated for an extended period of time (about 60 hours) at a temperature of 960 deg C, the cementite decomposes into austenite and graphite. By slow cooling from 960 deg C, the austenite transforms into ferrite or pearlite depending on the cooling rate and the diffusion rate of carbon. The ductility and toughness of malleable cast iron falls between that of ductile cast iron and gray cast iron. Now a days malleable cast irons have been replaced by the more economically produced ductile irons cast for many uses. Malleable cast irons besides ductility have good machinability. Ferritic malleable cast irons are more ductile and less strong and hard, than pearlitic malleable cast irons. Applications of malleable cast irons include parts of power train of vehicles, bearing caps, steering gear housings, agricultural equipment, and railroad equipment. With the advent of metallography, and as the body of knowledge pertinent to cast iron increased, other classifications based on microstructural features became possible. These classifications are made due to graphite shape or due to the matrix of the structure and are given below. Graphite shape – Due to the graphite shape cast irons are classified as (i) lamellar (flake) graphite (FG), (ii) spheroidal (nodular) graphite (SG), (iii) compacted (vermicular) graphite (CG), and (iv) temper graphite (TG). Temper graphite results from a solid-state reaction (malleabilization). Matrix of the structure – Due to the matrix of the structure cast irons are classified as (i) ferritic, (ii) pearlitic, (iii) austenitic, (iv) martensitic, and (v) bainitic (austempered). Besides the four basic types, there are other specific forms of cast iron to which special names have been applied. These are given below. Chilled iron – It is white iron that has been produced by cooling very rapidly through the solidification temperature range. Mottled iron – It is an area of the casting that solidifies at a rate intermediate between those for chilled and gray iron, and which exhibits microstructural and fracture-surface features of both types. Compacted graphite cast iron – It is also known as vermicular iron. It is characterized by graphite that is interconnected within eutectic cells, as is the flake graphite in gray iron. The graphite in compacted graphite cast iron is coarser and more rounded than the graphite in gray cast iron. Its structure is intermediate between the structures of gray cast iron and ductile cast iron. The unique combinations of properties obtainable in compacted gray cast irons make them superior to either gray or ductile cast irons. The major applications are disc-brake rotors and diesel-engine heads. Compacted graphite cast iron can be produced by carefully controlling the amount of magnesium added as an inoculant in a process very similar to the process used to make ductile cast iron. High-alloy graphitic iron -They are used primarily for applications requiring corrosion resistance or a combination of strength and oxidation resistance. They are produced in both flake graphite (gray cast iron), or spheroidal graphite (ductile cast iron). Lastly, a classification used frequently by the floor foundry worker divides cast irons into two categories. These are (i) common cast irons which are used for general-purpose applications mainly unalloyed or low alloy cast irons, and (ii) special cast irons which are used for special applications and are generally high alloy cast irons. Special cast irons differ from common cast irons mainly in the higher content of alloying elements (more than 3 %), which promote microstructures having special properties for elevated- temperature applications, corrosion resistance, and wear resistance. 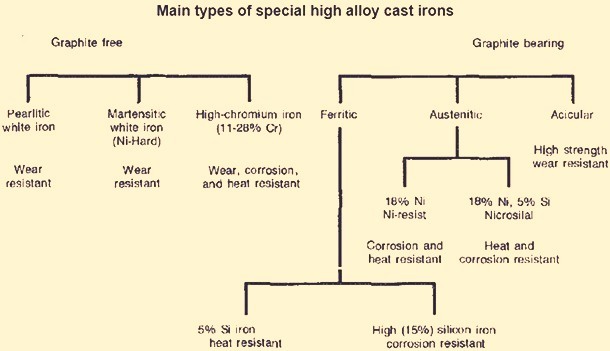 A classification of the main types of special high-alloy cast irons is shown in Fig. 3.